Menswear has seen some dramatic changes recently, with several menswear trends showing up, and they show every sign of staying around for a while. The most significant change has been that over the last several years, men’s suits, jackets, and other tailored clothing have become significantly shorter, more fitted and body conscious . Jackets now feature a narrow lapel, higher armhole, tighter sleeves, and more natural shoulders. Slack styles show up not only as flat front , but with a single reverse pleat, which can nip the pants in and give the appearance of a more fitted seat. Surely you have noticed slacks are narrower throughout the leg, and shirts are cut slimmer as well. How did this trend get started? In 2006 British designer Thom Browne featured a shrunken suit on his runway. At the time most thought it looked ridiculous, but that was a precursor to the more fitted trend we are all used to today. 1. Unless you are well-toned and proportional, you are better off going with a modified fit, rather than the short, tight, and super-fitted look. The modified fit will feature a jacket slightly shorter in the front, narrower armholes and be more contoured to the body. 2. The traditional boxier suit is a classic that will never go out of style. If this is your choice, however, in order to look current I suggest tampering with the look to add one new trend. 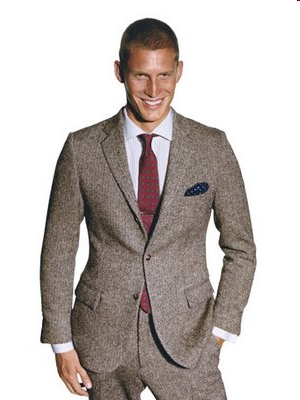 This can be a pair of bright socks, a two-toned shoe, or a shirt with a shorter, spread collar. 3. Going super-fitted but keeping a more traditional fabric like solid navy or gray, or a weave will be on-trend, but not make too dramatic a statement. It will also be more versatile regarding what shirt/tie combination works. 4. When wearing super-fitted suits, accessories need to be adjusted as well. Ties are thinner, shirt collars are shorter, and double check that your socks match, because everyone will certainly see them in your shorter pants. Other menwear trends to be aware of include the comeback of the watch. The newer looking watch is actually old, vintage-inspired, or sporty with a leather band. These watches aren’t flashy, but look as though they have lived on your wrist for a while. Sweaters are another retro trend that you will see a lot this fall. The colors on these sweaters are subdued, and they can be layered with a sport coat or leather jacket as the weather turns cooler. Outerwear is turning colorful in a trend for trench and fall-weight coats to sport a color other than tan or black, including burnt orange, forest green, or navy. These additional menswear trends can all work in nicely with the above suggestions regarding suits.